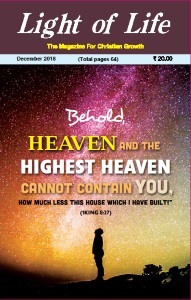 'Light of Life' is a monthly magazine published in India catering to the whole Christian family. The endeavour is to inspire, instruct, inform and influence people in becoming better followers of Jesus Christ. It provides a forum through a variety of articles and features where a Christian perspective is presented with a view to formulate Christian opinion in the country on matters of national and social significance. If Light of Life has been a blessing in your life, recommend it to others. You can also make gift subscriptions to others in the print or digital form. You may subscribe to the magazine either in the print form or in the digital form (PDF). The annual rate for the print or the PDF versions is Rs. 200. You can send the amount by electronic bank transfer to the Light of Life savings bank account No. 003601021256 (IFSC code ICIC0000036) in the Maratha Mandir Branch of ICICI Bank followed by intimating the details (your address, email address and choice of subscription - print or digital) by email to ' lightoflife2777@gmail.com '. The subscription may also be sent by regular money transfers. However it is important to send your email address for subscription to the digital version. Details and samples may be seen here for the digital version. Write to us for a free sample of the print version. Editorial: Keeping God in a box! - God is bigger and greater than any human understanding, says Jacob Ninan. Christmas, a perfect enactment! - Christmas is an occasion to celebrate the assurance of everlasting life through the supreme sacrifice of Jesus, exhorts J. Arthur Prem. Is not this the Christ? - How many untouchables do we avoid in our lives, asks Christiana Joseph. Are you the chosen one? - If you have faith in Jesus, be assured that you would be in His list of winners, states Shantha Kingston. The church in Antioch - There are many lessons for us to learn from the church in Antioch rather than at Jerusalem, teaches Peter S. C. Pothan. Not church but simply an organisation - Abraham Thomas lists the unscriptural and even blasphemous teachings of the Roman Catholic Church. Animal behaviour - Stanley Mehta teaches us how to deal with animal behaviour that we develop in us. Job’s wisdom to the fore - Suresh Manoharan lists the reasons why Job probably had more wisdom than King Solomon.